On my run this morning, the cold sushine revealed huge trees, uprooted, having ripped out yards and yards of pavement. Yellow police tape draped over dangling power lines, neighbors and dogwalkers, grateful to see one another, embracing, bonding over the no-power experience, laughing with the relief of having survived to see the sunrise. We’re all managing to stay in touch somehow, finding friends in corners of town with power, who invite us to a “charging-up” get together: bring your devices, a load of laundry: enjoy a cup of hot coffee, a few hours of heat. Last night we stayed with friends–which is how I’m able to post this. 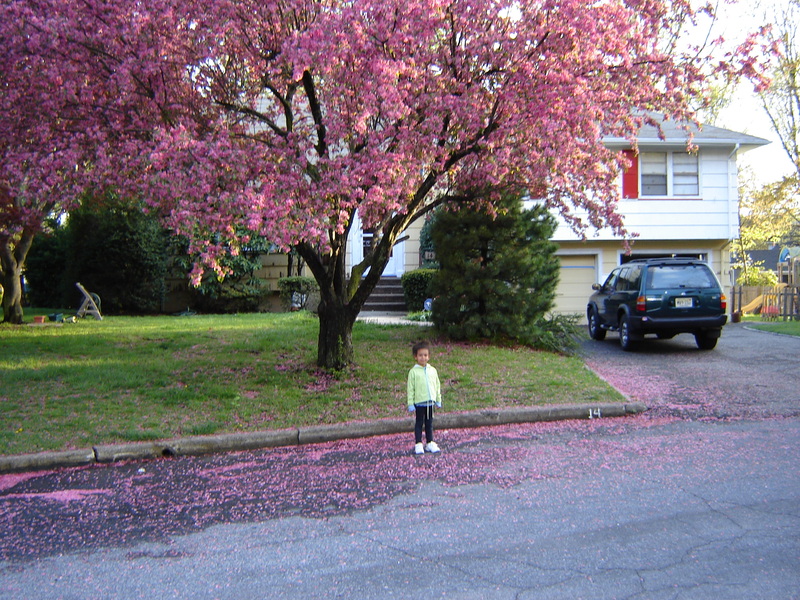 On my run, I went to our street to see if PSE&G had turned anything on. No. Only the loud hum of someone’s back up generator. Rumor has it that school won’t be in session until Monday at the earliest. Though Tuesday is election day–hence no school–and Thursday and Friday are the NJEA teachers conferences, AKA no school. The kids have been great. Up at their usual hour, playing with legos, building forts out of the living room furniture, gathering with the kids on the block to scooter around the cul de sac. They’re all cautioned to STAY OUT OF THE BACK YARDS, many of which are full of downed powerlines. They listen. The smallest ones don’t go out without adult supervision anyway. There is a spirit of good will all around, the way disaster often brings people together. We may be on opposite sides of a contentious election season, but I have extra batteries to share and you’ve just helped move those branches off my driveway and we’ll both write checks for hurricane relief as soon as the postal service resumes. What we are is human and in this together. Our hearts break when we hear the stories of people who have lost everything in the floods or fires, the young couple out walking their dog, crushed and killed by a fallen tree. We do not care whether they were Democrats or Republicans. We don’t care whether they supported Romney or Obama. Disaster teaches us to value what we have, to treasure what matters most and to appreciate one another. The only way to survive, and rebuild in the aftermath is for us all to come together and put aside our differences. The fact that New Jersey Governer Chris Christie and President Obama have done just this, sets an example for the rest of the country and makes me proud to be an American. The press is billing this the Jersey “Bromance.” To me, they’re a little like the Odd Couple: Obama, neat, reserved, fit, if a little too lean these days: Christie: with his shoot-from-the-hip bluster, a bigger-than-life persona and voice to match. Call the relationship what you will, it is so gratifying after all the partisan us-versus-them mentality of the campaigns, to see these two together, on the same team. All over the internet are photographs of the Governor and the President shaking hands, sharing a laugh, deep in conversation (where it appears they’re listening to one another), joining in group hugs with citizens whose lives and livlihoods have been compromised by the storm. 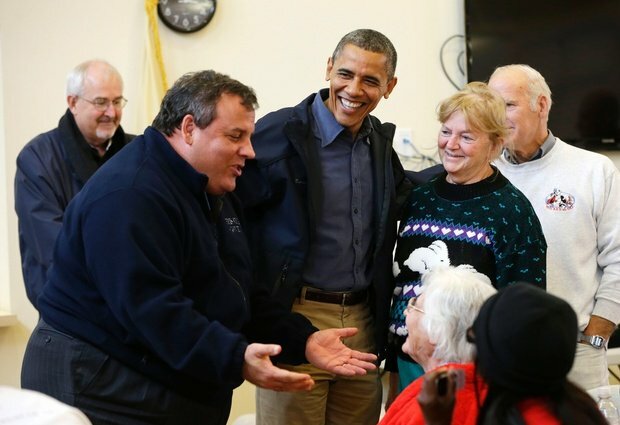 Chris Christie, President Obama and FEMA Administrator, W. Craig Fugate (far left) greeting some of my fellow New Jerseyans. As they tour the state, investigating Sandy’s damage, they have put aside their differences and praised one another, forging a positive working relationship that has some scratching their heads, others breathing a sigh of relief. Since Obama’s election in 2008, there have been plenty of Republican politicians and pundits whose first priority has been to make him a “One Term President.” We have just a few days left to see whether or not they have succeeded in making Obama look bad at the expense of the country. One thing is clear: Chris Christie–despite having been a harsh critic of the president’s in the recent past–is not playing their game, or any other frankly. He is trying to save his state and the hardworking people in it–as well he should–and to do so, is welcoming the participation of the federal government. A big faux pas for a Republican possibly seeking higher office come 2016? Maybe, but I suspect Christie doesn’t care. I also suspect, and hope, that the average American respects the common-sense joining of forces for the greater good more than petty party loyalty. 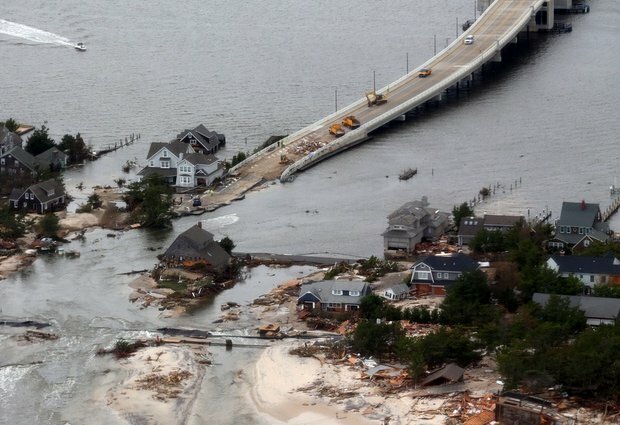 There is no doubt that Hurricane Sandy has wreaked havoc on our area, leaving untold tragedy in her wake. But let there be a sliver of a silver lining to the pain. As the tristate area cleans up, re-starts and revives, let’s all take a moment to asknowledge the American values of cooperation and partnership.